Fetch the current configuration with the GET VMware anomaly detection configuration call. Update the current configuration with the PUT VMware anomaly detection configuration call. Validate the intended configuration update with the POST verify an update call. You can manage the same configuration also in the Dynatrace UI at Settings > Anomaly detection > Infrastructure > VMware. Gets the configuration of anomaly detection for VMware. The configuration of the anomaly detection for VMware. How to detect CPU saturation on ESXi host. How to detect memory saturation on ESXi host. How to detect overloaded storage on physical storage device. How to detect undersized storage device. How to detect physical storage device running slow. How to detect low datastore space. The configuraiton of the low datastore free space detection. Custom thresholds for low datastore free space. If not set then the automatic mode is used. Alert if datastore free space is lower than X%. The configuration of the high number of dropped packets detection. Custom thresholds for high number of dropped packets. If not set then the automatic mode is used. Alert if receive/transmit dropped packets rate on NIC is higher than X packets per second in 3 out of 5 samples. The configuraiton of the physical storage device running slow detection. Custom thresholds for slow running physical storage device. If not set then the automatic mode is used. Fulfillment of any condition triggers an alert. Read/write latency is higher than X milliseconds in 4 out of 5 samples. Peak value for read/write latency is higher than X milliseconds in 4 out of 5 samples. Custom thresholds for undersized storage device. If not set then the automatic mode is used. Average queue command latency is higher than X milliseconds in 3 out of 5 samples. Peak queue command latency is higher than X milliseconds in 3 out of 5 samples. The cofiguration of the overloaded storage on physical storage device detection. Custom thresholds for overloaded storage on physical storage device. If not set then the automatic mode is used. Alert if number of command aborts is higher than X in 3 out of 5 samples. 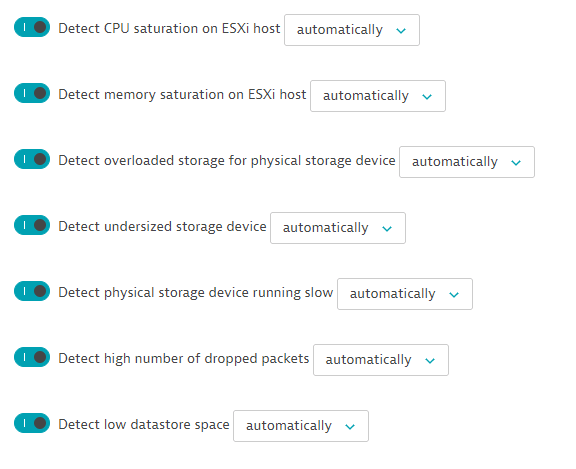 The configuration of the memory saturation on ESXi host detection. Custom thresholds for memory saturation on ESXi host. If not set then the automatic mode is used. Alert if ESXi host swap IN/OUT or compression/decompression rate is higher X kilobytes per second in 3 out of 5 samples. 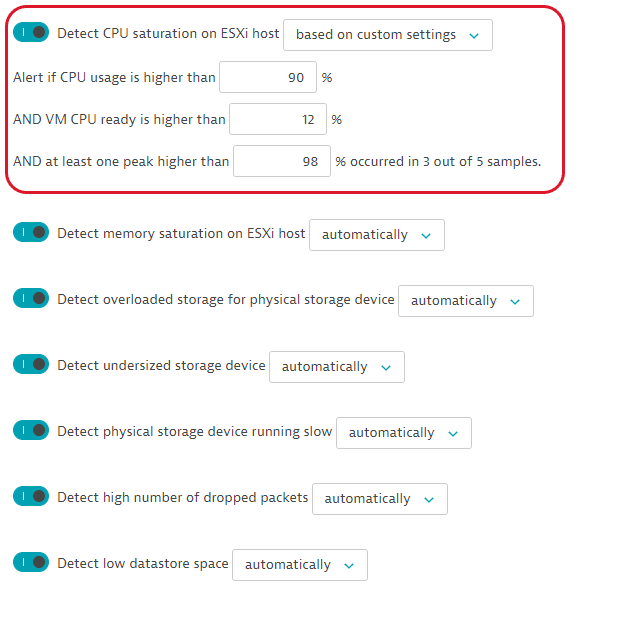 The configuration of the CPU saturation on ESXi host detection. Custom thresholds for CPU saturation detection on ESXi. If not set then the automatic mode is used. CPU usage is higher than X% in 3 out of 5 samples. VM CPU ready is higher than X% in 3 out of 5 samples. At least one peak higher than X% occurred in 3 out of 5 samples. In this example, the request lists the current configuration of anomaly detection for VMware. Updates the configuration of anomaly detection for VMware. JSON body of the request, containing parameters of the VMware anomaly detection configuration. AND at least one peak higher than 98% occurred in 3 out of 5 samples. You can download or copy the example request body to try it out on your own. Be sure to create a backup copy of your current configuration with the GET VMware anomaly detection configuration call. Validates the payload for the PUT VMware anomaly detection configuration request.